^ Earth's Oceans. EnchantedLearning.com. Retrieved on 2013-07-16. ^ The Indian Ocean and the Superpowers. Routledge. (1986). ISBN 0-7099-4241-9. http://books.google.com/?id=2pMOAAAAQAAJ&pg=PA33. ^ Donald W. Gotthold, Julia J. Gotthold (1988). Indian Ocean: Bibliography. Clio Press. ISBN 1-85109-034-7. http://books.google.com/?id=ujoRAAAAYAAJ&q=292,131,000+cubic+kilometers&dq=292,131,000+cubic+kilometers. ^ Mathur, Anand (2003). Indo-American Relations: Foreign Policy Orientations and Perspectives of P.V. Narasimha Rao and Bill Clinton. Scientific Publishers (India). p. 138. ISBN 978-81-7233-336-2. http://books.google.com/books?id=pTR2AAAAMAAJ+. "India occupies the central position in the Indian Ocean region that is why the Ocean was named after India"
^ Váli, F. A. (1976). Politics of the Indian Ocean Region: The Balances of Power. Free Press. p. 25. ISBN 978-0-02-933080-7. http://books.google.com/books?id=_P4MAAAAIAAJ. ^ Hussain. Geography Of India For Civil Ser Exam. Tata McGraw-Hill Education. pp. 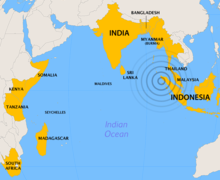 12–251; "India and the Geo–Politics of the Indian Ocean"(16–33). ISBN 978-0-07-066772-3. http://books.google.com/books?id=wUzKCZxvNQoC&pg=SA12-PA251. ^ Stow, D. A. V. (2006) Oceans: an illustrated reference. Chicago: University of Chicago Press, 0-226-77664-6 - page 127 for map of Indian Ocean and pp. 34-37 regarding trenches - but due to the recent discovery, some texts and maps are yet to include the feature. ^ The World Factbook. Cia.gov. Retrieved on 2013-07-16.